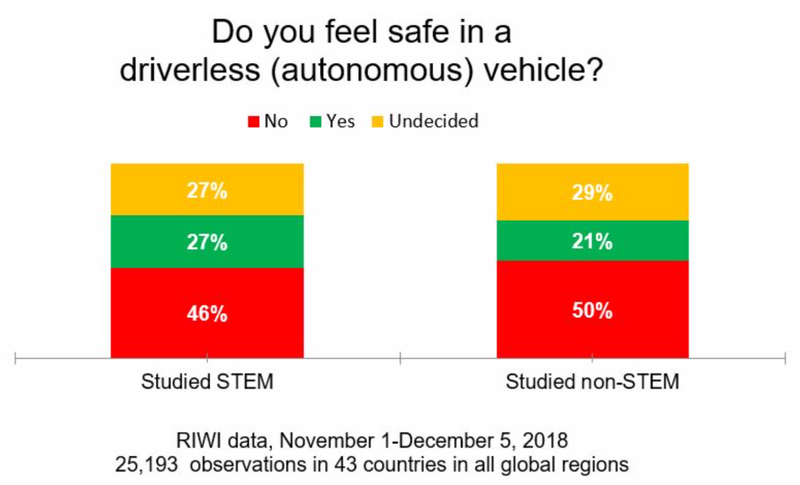 According to recent RIWI data, no, we are not ready for autonomous vehicles (AVs), as the majority of the global public indicate their distrust and discomfort with the technology. Data from RIWI’s Tech Fear Index show that 1 in 2 would not feel safe in an AV, 1 in 4 are undecided, and less than 1 in 4 would feel safe. Even those we might expect to be more open are not ready: almost half of young people and almost half of those that are educated in STEM fields or employed in tech jobs would not feel safe. See more data from RIWI’s work on AVs here.